Among the accomplishments of Jules-Sébastien-César Dumont d’Urville (1790-1842) was helping France gain possession of the Greek sculpture, the Venus de Milo in 1820. 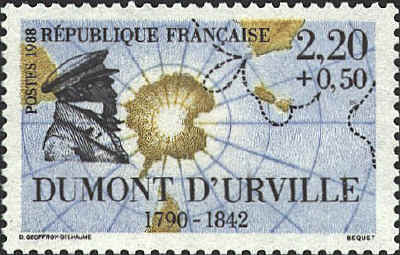 In 1837 he sailed for the Antarctic, and ultimately sighted the Adélie coast, naming it for Mme d’Urville. He returned to France in 1841 and the next year he, his wife and son were killed in a railway accident. He published two accounts of his voyages: Voyage of the Corvette Astrolabe, 1826-1829, and Voyage to the South Pole and Oceania, 1837-1840.